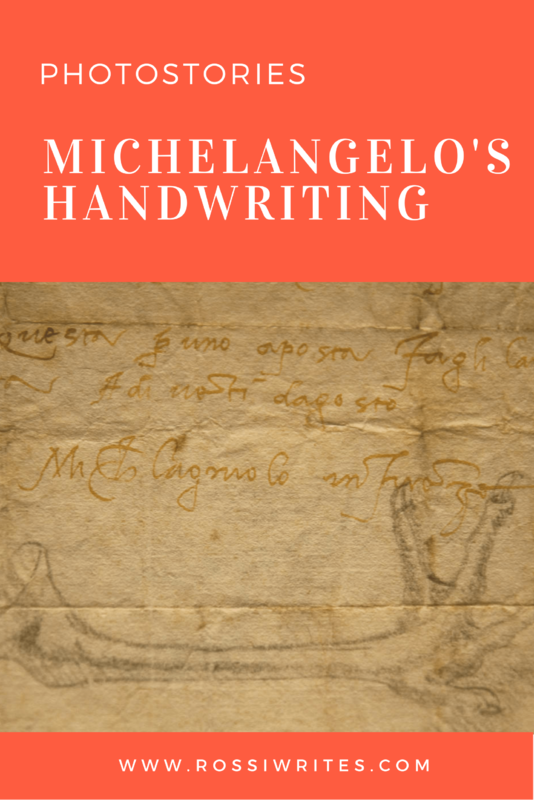 Michelangelo’s handwriting turned out to be neat and beautiful. Executed with an artistic flourish of the pen and the masterful control of a skilled hand. And I was utterly delighted when right underneath his missive – crumpled and yellowed with the passage of time – I could easily read his signature – Michelagnolo – the pet name of the great sculptor and artist. I have been an ardent fan of Michelangelo and his works ever since I read the magnificent book on his life ‘The Agony and the Ecstasy’ by Irving Stone. This happened in my early teens and I remember being utterly engrossed by the paragraphs about his first steps in the world of artistic expression in the studio of his teacher Ghirlandaio. In all honesty, I may have skipped through the many pages of political intrigues and focused mainly on the descriptions of Michelangelo working on his masterpieces. Years later I was lucky enough to come face to face with some of his works: a painting in the National Gallery in London, another in Uffizi in Florence, both depicting people on canvas as though they were statues – perfectly proportioned, powerful and seemingly chiseled from the paint. And, then, of course, my meeting with David in Accademia, which left me utterly and totally in love with the perfection of art. I came across Michelangelo’s handwritten letter pictured herewith by pure chance. Back at the end of May I was going down a street in Vicenza on my way to whatever place I needed to be in thirty minutes from that moment in time. Suddenly, my eyes focused on a big poster advertising an exhibition in a nearby palazzo due to finish in a day. Quite spontaneously, I walked in. I found myself in one of the splendid painted rooms of the 18th century Palazzo Cordellina. All around me glass displays held priceless letters, documents, literary works and even architectural plans handwritten and signed by some of Italy’s and the world’s best. I marveled at the handwriting of Palladio, Rossini, Canova, Galilei and even Victor Emmanuel III and Benito Mussolini. Of them all, I was most excited when I came across Michelangelo’s letter, adorned with his sketches of a bird of prey’s feet and a human leg. It had been sent on 20th August 1519 to Pietro Urbano. At the time the sculptor was working on the facade of the Basilica of San Lorenzo in Florence – a commission given to him by the Medici Pope Leo X. His faithful assistant Pietro Urbano had been sent to Carrara to oversee the extraction of the white marble needed for the facade. Hence the letter and the urgency of its missive. Michelangelo wanted to know if the marble for the columns and the statues for the facade had already been extracted and of what quality it was. The presence of the pencil sketches around the text made it look like the sculptor, in his haste, had grabbed a piece of paper on which he had been doodling a bit. Seeing this letter with its perfectly spaced and lined up words felt very personal, almost too intimate. It was one thing to admire pieces of art created by the hand of Michelangelo and analysed in minute detail by art historians and experts all over the world. It was a completely different thing to peer into his private correspondence, see the immediate effort of his hand and try to decipher words meant for a particular recipient. It made me feel a bit closer to Michelangelo and see him as a human with his own emotions and worries, rather than the streamlined image of a great sculptor and artist whom we have all put on a high unreachable pedestal. Based on his amazing works of art, I would say this was quite spot on. Michelangelo’s letter had been donated to the Biblioteca Bertoliana in Vicenza by Count Antonio Porto in 1866. It will be included in an exhibition to take part at New York’s Metropolitan Museum in 2017. The exhibition at which I came across it in Vicenza’s Palazzo Cordellina was called Signa Da Michelangelo a Montale Storie dagli autografi della Bertoliana and it was held in May of this year. Who is your most favourite sculptor or painter? What is it in their art which speaks right to your soul? Share with me your experiences in the ‘Comments’ section below. I would love to read them and engage with you.